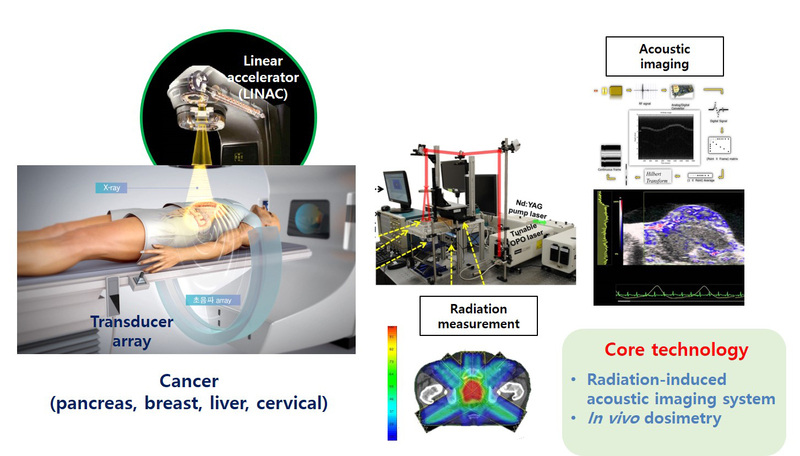 The purpose of CRiCT aims at developing a novel in vivo dosimetric system and theranostic technology of radiotherapy (RT) by developing radiation-induced acoustic imaging (RAI) technology that convert radiation absorption energy to acoustic signal using nanocomplex. We expect to develop striking RT-based nano-theranostic probes and RAI systems. Once they are commercialized, the impact would be significant in diagnostics and therapueics of diseases. Typically, companies in the developed countries including USA and EU occupy most of medical device and drug markets. Therefore, we need to develop independent technology in biomedicine and theranostic approaches that will open the new avenue. 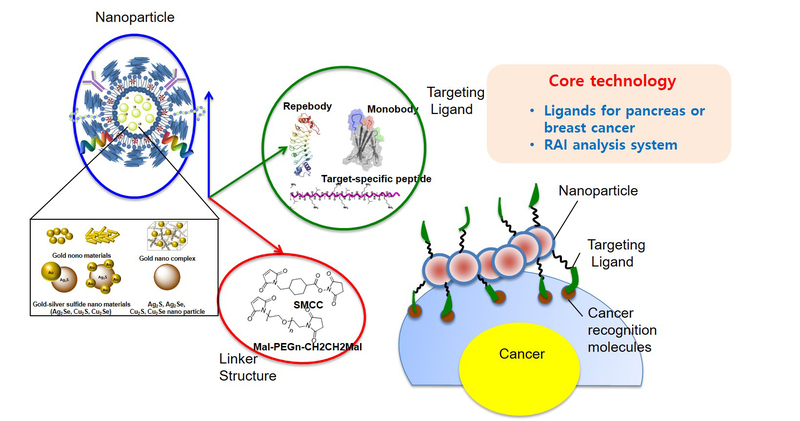 To our knowledge, the present technology combining both radiation absorbing nanoprobes and RAI system has not been implement anywhere, and therefore we strongly believe that we can suggest the original platform technology and original intellectual properties through this research. Furthermore, this will lead significant impact on bio-medical industries. 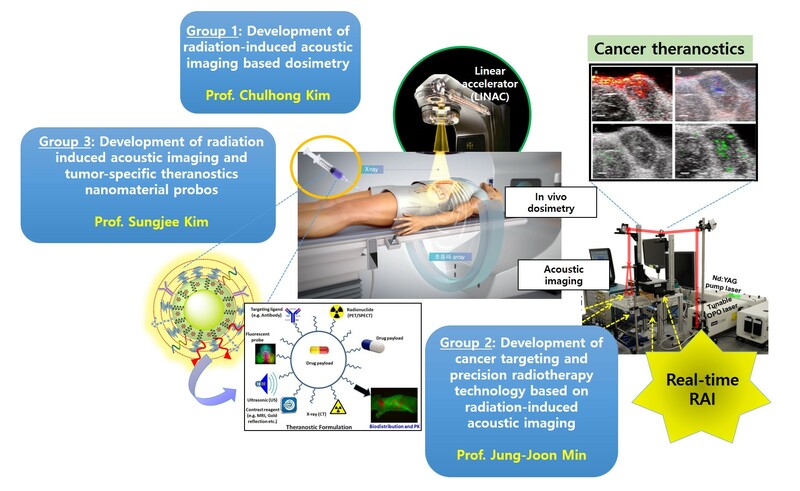 The purpose of our group is to develop radiation (X—ray) induced acoustic imaging (RAI) system to measure real-time X—ray dosimetry inside of live subjects in vivo and to monitor the radiation treatment. After injecting the radiation absorbing nanostructure and specific targeted biomarker in small mouse, we will sensitively and specifically image diseased areas and radiation dosimeter using developed RAI system in vivo. Further, we will quantify the acoustic wave generated by radiation absorption, and then we can quantify the mount of radiation in each treatment stage. We intend to develop nanomaterials that have high radiation absorption coefficient for simultaneous diagnosis, dosimetry, and therapy based on pulsed x-ray radiation. The materials can respond tumor microenvironment and selectively absorb radiation. Absorbed radiation can be converted into heat. The heat generates acoustic signal due to thermal expansion. The acoustic signal can be used for ultrasound imaging. The heat can be also applied for hyperthermia and stimulate release of anticancer drug. Also, absorbed radiation can be generated the reactive oxygen species. This enables highly efficient anticancer therapy by combining chemotherapy, photodynamic therapy, and hyperthermia. This proposal aims studies necessary to translate the combination into practical applications. In this research, we will investigate therapy effects and mechanisms by studying change of the blood distribution and response of cells through the high performance imaging technique using radiation induced acoustic based nanoprobes and developing nanoprobes which are capable of simultaneous diagnosis and therapy.